Ernst Haeckel's illustrations and Thompson's, On Growth and Form informed this series of watercolor and acrylic paintings. 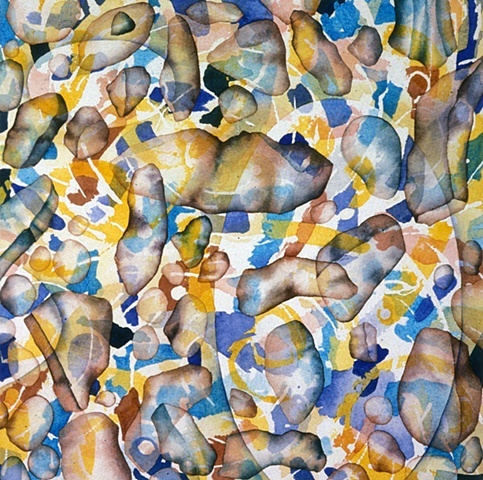 The various manifestations of energy that create patterns for growth and form in nature and the visual connection between these elements are central to this series. One such manifestation of energy is the magnetic field that embodies a directional organization and appears in the basic structures of simple biological forms. Embedding this linear abstraction into the surface of each painting creates an underlying complexity in the painterly ground. Modeled volumes, flat shapes, stenciled shapes and contour drawings float and spin out of control in this space. There is a continual push for a dynamic surface and spatial tension that fluctuates between in and out, around and behind, thick and thin and flat and deep. The manipulation of color and light add a surreal tinge to the paintings as they take on a life of their own.